Follow in the footsteps of a literary genius, live in an abandoned quarry or snuggle up a wooden house perched like a bird on a tree. Make this winter count with some of the most unique holiday breaks. TTN puts together some great ideas to entice your clients this fall. If in the US this winter, make sure you head to one of the glampinghub.com tree houses, that are sure to make you relive your childhood fantasies. This secluded treehouse in the Appalachian Mountains, perched in Flintstone, Georgia, boasts of a quirky and vintage style, with an incredible flooring made from hundreds of sparkling pennies. In the evenings, curl up in the light and airy living room, reading a good book from your favourite collection, or catch up on the day’s events, says Josephine Wawira, PR manager, Jumia Kenya. During the day, catch amazing views from the floor-to-ceiling windows. Prepare a delightful meal in the compact and functional kitchenette, which also contains a selection of free snacks and chilled drinks. Whatever the weather and occasion, you are assured of comfort using the property's state-of-the-art climate control, and a private outdoor fire pit which comes with its very own s'mores kit for the complete outdoor experience. From up the tree to down on the beach, that’s how we roll it! Finolhu in the Maldives has unveiled a new Beach Bubble tent – the first of its kind in the archipelago – on a secluded stretch of its Fish & Crab Shack sandbank. Conceived and custom-designed by Eye In The Sky, the transparent inflatable bubble is a unique, inspiring environment where guests can enjoy an incredible, closer-to-nature experience – without compromising on high-spec design and luxurious creature comforts. Dramatically located in a secluded spot along Finolhu’s famous 1.5km sandpit, far from the buzz of the island’s iconic 1 OAK Beach Club, the Beach Bubble is available exclusively for incredibly romantic, one-night-only ‘Dream Eclipse’ experiences under the stars. After a lip-smacking lunch at the Fish & Crab Shack, a short sunset stroll leads guests to their very own Bubble Beach hideaway where they can chill out, enjoy a beach BBQ with a Maldivian twist, and then retreat into their private bubble for an unforgettable night under endless stars. On waking from this dreamlike experience, guests can watch the sun climb into the sky as they linger over breakfast at the water’s edge. 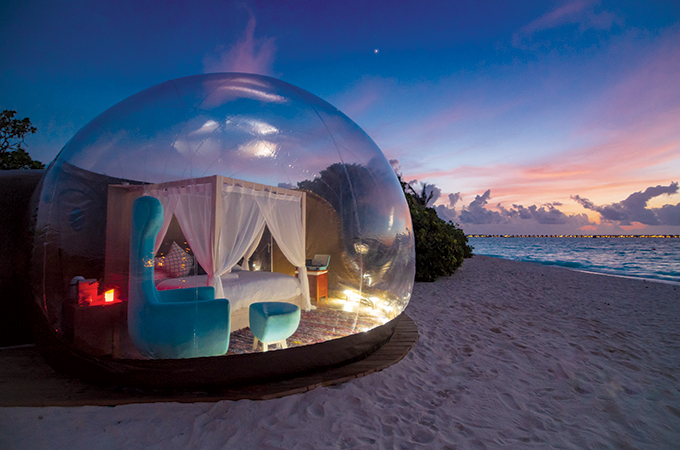 The Bubble Tent provides a UV-protected, fully waterproof, climate-controlled cocoon that offers guests a uniquely immersive nature experience. The Bubble is an exclusive worldwide patented Precontraint Serge Ferrari technology and acquires distinctive properties in terms of resistance, dimensional stability and light weight, eliminating deformation due to load and offering a longer useful life. The interiors feature custom-fitted wooden floors and bespoke furnishings, and a separate adjoining bubble bathroom with WC and shower. Ever wondered what it would be like to follow in the footsteps of some of the most iconic writers in the English language? Dublin retains its prestigious reputation as one of the literary capitals of Europe. Head no further than Dublin 4, which was James Joyce’s last address as a resident of Ireland but marked the beginning of his journey as one of Ireland’s most celebrated and influential writers. The area of Ballsbridge home to Dublin 4, which the five-star InterContinental Dublin hotel is situated in, was once home to many Irish writers, with iconic landmarks still existing. The luxurious five-star hotel has recently renamed three of its most spacious suites after a very well-known Irish writer, poet and dramatist. The three suites, The James Joyce, The William Butler Yeats and The Lady Gregory have recently been lavishly refurbished with the finest silks, carpets and soft furnishings in muted, peaceful tones. We at TTN recommend The James Joyce Suite, formerly the hotels Presidential Suite, as it is the largest suite in any five-star hotel in Dublin. It boasts 2,691 square feet offering a master bedroom, spacious living room with a fully stocked bar, dining area that can host up to eight people and a separate kitchen which is ideal for entertaining guests. There is also a possibility to interconnect to make a Three Bedroom Suite, with its own private entrance. Enjoy a four-piece Italian marble bathroom with L'Occtane amenities paired with Joyce’s famous Lemon Soap from Sweny’s Pharmacy. Relax on the balcony with views over the leafy historic neighbourhood of Ballsbridge and Dublin skyline, The James Joyce Suite is the perfect choice for sophisticated travel with a luxurious spacious feel. After a specially trying summer here in the Gulf, we understand completely if travellers want to get away from the hustle and bustle of the city. If the summer has taken a serious toll on your soul, a visit to wellness retreat Atmantan is on the cards. 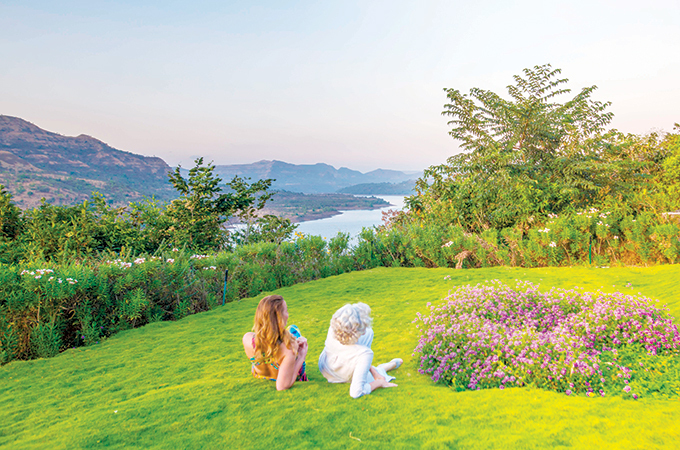 The 106-key retreat is built on a natural crystal bed that emits positive energy in the Sahyadri hills of Pune, India, and set in 42 acres of lush green valley overlooking the picturesque Mulshi Lake. Brought together by two health and fitness visionaries who have brought their complementary backgrounds in pranic healing and fitness, the experienced team employs a highly personalised approach to each guest and their needs, applying their certified expertise across a myriad of fields and global disciplines, including naturopathy, Ayurveda, oriental and western treatments, nutrition, yoga, physical therapy and fitness. Nine Atmantan Living Retreats can be undertaken over three, five or seven-day stays. Whether the goal is to improve fitness, enhance yoga practice, manage stress, improve sleep, restore energy levels, address injury, or lose weight, all programmes offer a transformational experience that provides guests with lasting tools to take into their everyday lives. Each programme includes an individual wellness consultation with a doctor on a guest’s first day, body composition analysis, postural assessment, synergistic integration of selected therapies and spa cuisine, daily fitness and leisure activities. To tailor supporting nutrition to each individual’s goals, Ayurvedic doshas are assessed and, where relevant, a bespoke detox menu planned. All retreats of the same length are priced equally, no matter which programme is chosen. All 106 luxurious guest rooms and villas – with spacious balconies or private gardens – overlook the magnificent mountain setting. All rooms are complete with full amenities including air conditioning and paraben-free, natural aromatherapy bath products. 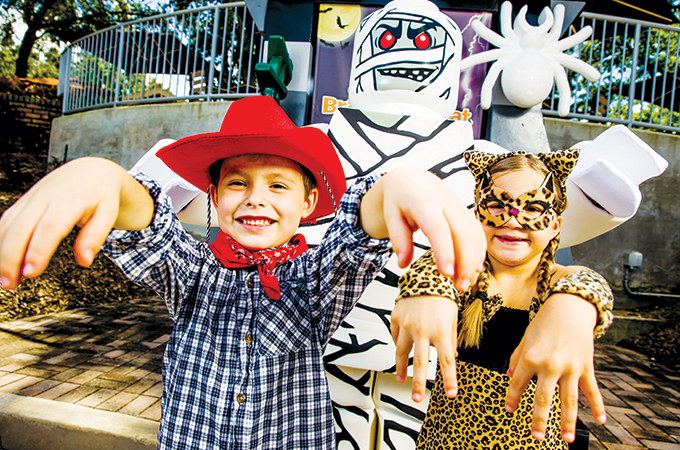 Have a haunting October in Orlando as the Halloween Vacation Capital offers a lineup of the nation’s top Halloween events running through November 3, and there’s something for everyone, from mild and family-friendly to wild and terrifying. This year’s lineup includes a host of all-hallows events and attractions; themed hotel packages; and the return of the largest horror convention in the nation. Visit Orlando, Orlando’s official visitor resource, has even created a special web page to help travellers plan a ghoulish getaway at VisitOrlando.com/Halloween. If you are a fan of Netflix’s mega-hit “Stranger Things” (and who isn’t? ), a visit to Universal Orlando Resort’s Halloween Horror Nights is a must. The park has a haunted house in the theme of “Stranger Things,” as well as nine other haunted houses, for a total of 10 – the most ever in the event’s 28-year history. The event will also run for a total of 34 nights, tied for the longest run in its history. Other theme park events include Mickey’s Not-So-Scary Halloween Party, SeaWorld’s Halloween Spooktacular, and Brick or Treat at LEGOLAND Florida Resort. Spooky Empire, the largest horror convention in the nation returns to Orlando on October 26 to 29 at the Caribe Royale Orlando. This year's lineup of celebrity guests includes David Duchovny and Gillian Anderson of X-files fame, and Kathy Najimy of Disney’s Halloween classic Hocus Pocus, with more to be announced. Other thrills and chills at the convention include a tattoo festival, costume contest, zombie walk and film festival. A Petrified Forest features two outdoor scare trails for small groups to venture through a haunted forest at night. American Ghost Adventures offers a wide variety of year-round paranormal experiences. Zombie Outbreak challenges guests to see how long they could survive a zombie apocalypse, Mortem Manor Haunted Attraction at Old Town features year-round scares, and The City of Orlando's Moonlight Walking Tours take guests on a dark, historical stroll through Greenwood Cemetery. Three Hyatt properties are offering a “No Tricks, Just Treats” package, until November 4 to get guests into the Halloween spirit. Hilton Orlando is offering “a room with a boo” package, which includes daily breakfast, premium wi-fi and late checkout. Home to nesting Oliver Ridley turtles, dolphins and blue whales, and India's International Institute for Diving, Bhogwe Beach was recently named as one of Asia's first blue flag beaches. Coco Shambhala, Sindhudurg, Malvan's first luxury villa accommodation, champions sustainable tourism. "Our distinctive brand of wild, rugged luxury and warm hospitality is designed to celebrate, support, and sustain the untouched nature and rich culture of the place and its people", says owner, Giles Knapton. Coco Shambhala's environmentally friendly approach runs as deep as the property's foundations (or lack of them). Everything from the eco-friendly coconut wood, to the 'Catch of the Day', are locally sourced. Tailor-made menus celebrate the best of international flavours whilst using traditional techniques; local produce is transformed by Michelin trained chefs. Almost all of the staff are from the neighbouring villages. Located in one of the least populated areas in India, each two-bedroom villa includes its own infinity pool with 180-degree views of the Arabian Sea. Nestled along the Western Ghats, an area of incredible biodiversity, guests can go in search of the elusive leopard, Indian bison, basking crocodiles, and a colourful array of birdlife. Trek through jungle, tribal villages, past ancient temples, on to find concealed waterfalls. If that all sounds too exertive, what about sunrise meditation on a deserted beach, private yoga sessions, or a massage treatment at the in-house spa? At Coco Shambhala, Sindhudurg the methods by which to unwind are exhaustive. The nearest airport is currently Dabolim Airport, Goa, a two-and-a-half-hour journey by road. Transfers are provided on a complimentary basis. By December 2018 Sindhudurg Airport, just 15-minutes by road, will open, providing direct flights from Mumbai’s Chhatrapati Shivaji International Airport. Located less than an hour from the city of Tokushima on rugged Shimada Island and overlooking the whirlpools of Naruto, Hotel Ridge is a luxurious natural escape where adults can reconnect with nature and reset their equilibrium. The resort blends traditional Japanese hospitality and aesthetics with modern design and technology to create an exclusive wellness experience that embraces the indulgence of fine wine and delicious food. With just 10 expansive Western and Japanese suites providing spectacular views of the famed Ohashi Bridge, the craggy islands of the Seto Inland Sea, and the untamed nature of the Setonaikai National Park, Hotel Ridge provides both unparalleled natural beauty and exclusive service. Guests are invited to experience Japan's rich bathing culture at the natural hot spring, rising rich in minerals from 1500 metres below the earth into a spacious outdoor bath best enjoyed at night beneath an awning of stars undimmed by city lights. Or guests can indulge at the full-service spa, where a regularly changing menu of treatments uses seasonal ingredients to provide just the boost needed at different times of year. At mealtimes, two on-site farm-to-table restaurants serve fresh produce sourced from a network of trusted farmers around Shikoku. Exclusively for staying guests, Banriso offers flawless kaiseki, traditional multi-course Japanese dining, in elegant facilities exuding the spare dignity of an imperial residence, with undulating naguri-style wood floors and private tatami dining rooms surrounding a central courtyard garden. Affiliated with Hotel Ridge is the Otsuka International Art Museum, one of Japan's largest. The sprawling facility doesn't house any original artworks, though. Instead, it is filled with thousands of full-size replicas of Western masterpieces from the Sistine Chapel to Guernica. Otsuka's proprietary technology images and recreates the artworks on ceramic tiles, allowing a tactile experience unthinkable with originals and an excellent overview of Western art history in one location. Hotel Ridge is a refuge from the hectic pace and demands of daily life, a luxury retreat where guests can revel in the beauty of the changing seasons and the quiet of nature without foregoing the uncomplicated pleasures of fine dining and luxury accommodation. The Anam in Cam Ranh Vietnam is probably not the first destination that comes to mind when one thinks of Christmas and the New Year, the five-star beachfront resort is pulling out all stops this year. The jam-packed programme features grape tasting, Christmas tree lighting, Christmas cookies and mulled wine, Christmas choir performances, cocktail parties, music, drinks and lots and lots of X-Mas eats. 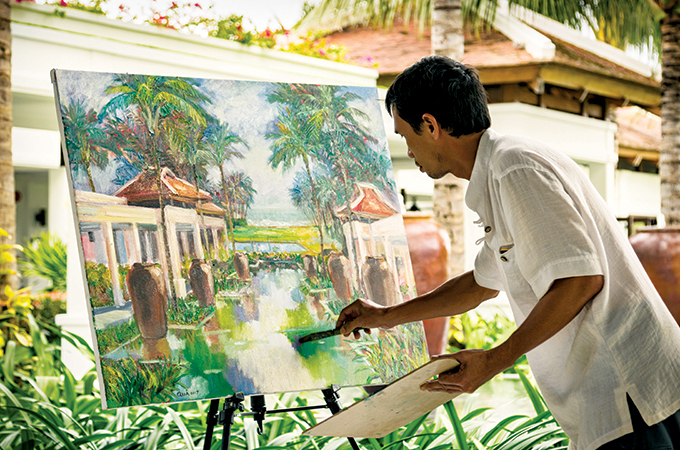 From December 26-31, the resort will hold its second annual ‘Garden and Sun Artist in Residence’, during which the resort’s lush gardens will transform into a sprawling open-air art studio. Guests will be encouraged to watch and talk with talented local artists as they create artwork from December 26 to 29.